BALTIMORE – The Dow dropped 174 points yesterday, the biggest fall in six weeks. Not the end of the world. Maybe not even the end of this year’s bounce-back bull run. As you’ll recall, stocks sold off at the beginning of the year, too. Then, investors were buoyed up after central banks got to work – jimmying the credit market on their behalf. The Fed swore off any further “normalization” until later in the year. Central banks in Europe, Japan, and China all took bolder and more reckless action… with the Bank of Japan following some European banks by going into “full retard” mode with negative interest rates. Now, according to the narrative popular in the financial press, investors are beginning to worry that central banks are not very effective after all. As to that last point, they’re right; central banks can only do so much. They made the situation what it is. Now, they can only make it worse. How? By adding more of what made it bad in the first place. All they can do is add more debt to a world already drowning in it. If anyone knows of a different way this story might unfold, we’d like to hear it. But for all the puzzling and preposterous guesswork and wondering, it is still the same tale: Debt builds up; debtors can’t pay; they go broke. It happens all the time. In a healthy economy – with real money and honest banking – people make mistakes. They go broke. The bankruptcies are absorbed and disposed of in good order. Assets go on the block. Hungry investors and entrepreneurs snap them up… and put them to good use. The system cleans out errors… taking money from “weak hands” and moving it to stronger, more capable management. But now, the whole system is mismanaged. Thanks to credit-based money – and modern central bank guidance – the normal ebbs and flows of the credit market have become treacherous tidal waves… lifting up assets to absurd deliriums… and then crashing them down on the hard rocks of real life. Here’s a group of surfers whose boards have been busted recently: young people. According to the WSJ, $200 billion in loans are running behind schedule. 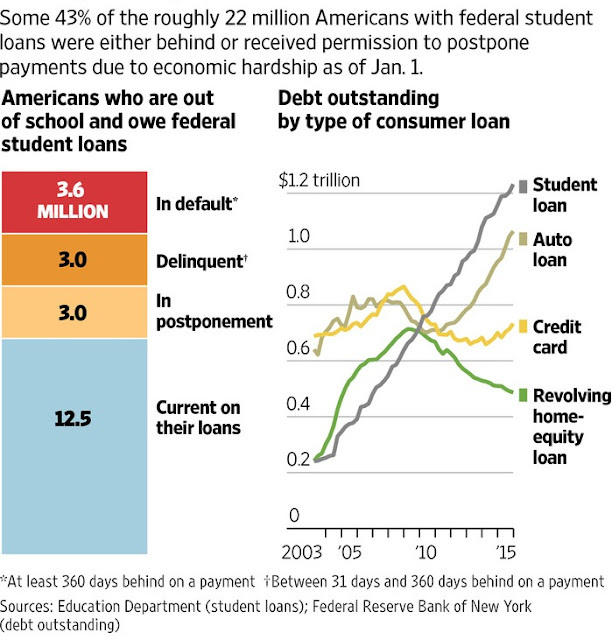 The Journal says this is good news; last year, it was 46% of borrowers who weren’t keeping up. When the next corporate default wave comes, it could hurt investors more than they expect. Losses on bonds from defaulted companies are likely to be higher than in previous cycles because U.S. issuers have more debt relative to their assets, according to Bank of America Corp. strategists. Those high levels of borrowings mean that if a company liquidates, the proceeds have to cover more liabilities. "We’ve had more corporate debt than ever, and more leverage than ever, which increases the potential for greater pain," said Edwin Tai, a senior portfolio manager for distressed investments at Newfleet Asset Management. In our open letter to Americans, we warned that there is a fatal “flaw” in the system. We are still figuring out how it works, but this appears to be one of the most intriguing nuances of the whole cockamamie story. You see, credit has a particularity that real money doesn’t. If I lend you a real dollar, you will have the dollar to spend, and I won’t. Then, when you pay it back, I will have the dollar to spend, and you won’t. Either way, the money supply is unchanged. The credit dollar is different. When the banks lend you a credit dollar, they “make” it out of thin air with a few keystrokes on a computer. Then, the dollar you have to spend didn’t exist before. So far, so good. But when you pay it back, what happens? It disappears as if… well… as if it never existed. The money supply contracts. We should say, “even if you pay it back, the money supply contracts.” Because there are other ways the money disappears. Negative interest rates, for example, cause people to hoard cash, or even increase bank savings, as they are doing in Japan. Either way, money disappears from circulation… reducing the “velocity of money”… and dropping the available money supply. Spending goes down, not up. The effect – as Chris Lowe demonstrated in our Market Insight – is the exact opposite of what the policymakers promise. Again, we see the proof that something isn’t working. Not for Janet Yellen nor for any of her delusional central banker buddies around the world. Their tricks no longer work. They just make the tidal wave higher.